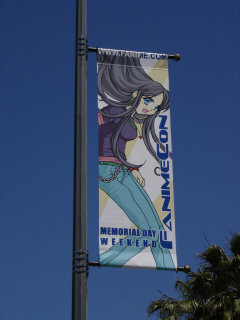 This year, as we do every year, we attended FanimeCon. However, we decided to not spend all our time taking pictures this year, so we only have a relatively small number of pictures. Friday included larger swap meet. Ed was recruited into the local chapter of the S.O.S Brigade from The Melancholy of Haruhi Suzumiya (www.animenewsnetwork.com). Even if it wasn't the bigest event of the day, a few of No-Name faithful stopped by where we were stamping frequent viewer cards. Contents of these pages © 2006 No-Name Anime. All Rights Reserved.